In September last year I reviewed my Le Creuset Butter Crock and inadvertently referred to it as a butter bell. I did not know that butter bell ® is a registered trade mark until I received an email from them informing of this. 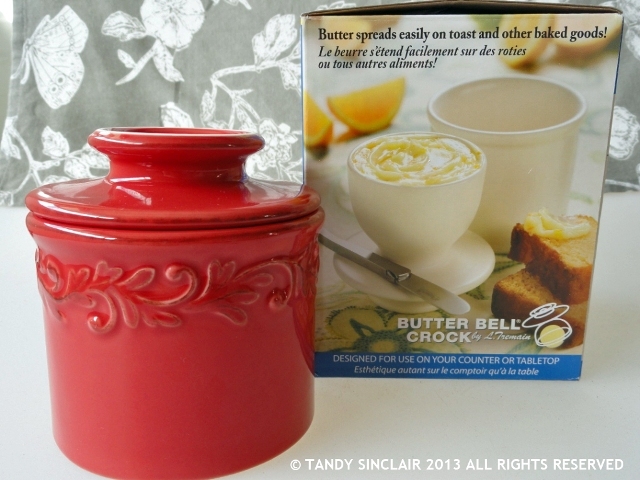 I immediately changed the description on my blog, and they sent me a butter bell ® butter crock to test. By the time the butter bell ® arrived, Dave and I were heading off for our overseas trip. I had to leave the testing until the December holidays when I could monitor it every day. I chose to do a comparison between the two so that you can make up your mind which one you would prefer to have in your kitchen. I can highly recommend both of these products as they work! The butter stays soft and spreadable and they are both an attractive item to any kitchen. For me personally, I will be keeping the Le Creuset one as it matches the rest of the products that I have in my kitchen. The butter bell ® will be given away as a gift to a lucky friend. Disclaimer: I was sent the butter bell ® as a gift and I was not required to write a blog post. The opinions and facts in this post are my own. This disclaimer is in line with my blogging policy. Thank you for the review and comparison. Full disclaimer, I work for L. Tremain, Inc., manufacturers and distributors of the Original Butter Bell® crock. There are a couple of things I would like to add. For those interested in purchasing our line of crocks, we do have a South African distributor and folks can order a Butter Bell crock at http://www.butterbell.co.za/ . Those who are interested can find multiple styles and colors to match any kitchen decor or countertop. Also, in regards to butter splitting or falling out…this happens if the butter is not packed in well to the crock. Here is a link to our FAQ webpage that addresses common questions about our crocks – http://www.butterbell.com/how-to-use-butter-bell-crock/ . Hi Jesse, thanks for the comment. I must say that I did pack the butter in quite firmly. I think it had more to do with the extreme high temperatures we experienced at that time of the year. I have never even heard of these products. The last time I left butter out it went rancid and I got the worst food poisoning!!! Does this stop this problem, is that what the water is for?? Tandy, did you fill each crock with butter just once at the beginning? Or each day? Not sure I follow what happened with the Butter Bell between days 5 and 7 – did you refill it on day 7? Thanks, this was intriguing..
And even with the heat it doesn’t turn to a puddle of melted butter! These both look like good products, but I think I would probably go for the higher capacity of Le Creuset. Good to know the difference! I have to say, the Butter Bell is very pretty. I always keep a stick of butter on the counter or table (it works better in cooking and baking as well as spreading) so a butter cellar tends to be more practical for me, but if I were to get a tub of butter I’d probably choose this one. I have a butter bell which I received as gift years ago. I tried it for a while but didn’t enjoy it as much as I did my butter dish. Perhaps I should give it another try! Thanks for sharing this info Tandy. I love this honest review!! I’ll always opt for Le Creuset. I have a good number of Le Creuset pots and pans, which have lasted me since God was a boy. Still haven’t seen these over here – will have to look around! I am intrigued by these Tandy. I always leave a small portion of butter out in a butter dish so I have spreadable butter on hand all the time but the heat of late has caused it to start melting and the ants are finding their way to it too! So it seems a butter bell / crock is the way to go.